Sandel can make most tooling in one to two days. 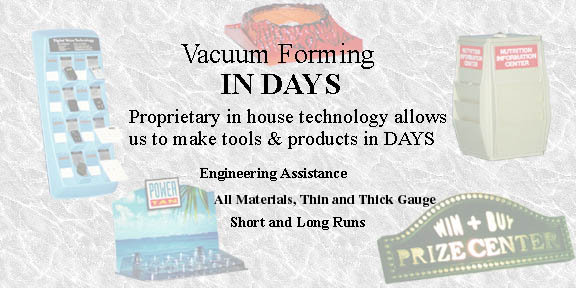 Products with multiple components may require several days. All products depicted herein were tooled in 1 to 5 days (except the Beam Kiosk and the Dermabrasion Unit). We can provide soft tooling for clients who anticipate design changes. These tools are fast and inexpensive and can be changed quickly with minor cost impact. Sandel Tooling is made from a proprietary medium that has a lower coefficient of thermal expansion and operates at a lower equilibrium temperature than aluminum. Simply put, these tools do not grow or shrink during vacuum forming. This allows us to make parts, like the Marine Pods, which must fit together line-to-line and large parts of consistent size without temperature controlled tooling. Under certain circumstances, we can produce a relatively Deep Draw for special applications. The rapid prototyping industry has greatly accelerated the development cycle. Stereo-lithography, fused deposition modeling (FDM), and other methodologies use computerized modeling software to create solid models. Sandel Products can make vacuum forming tools directly from these solid models. This procedure allows the client to create a model or prototype which can be used to create the vacuum forming tooling. This eliminates intermediate steps going from prototype to production.